It may not be the Smithsonian, but we are lucky enough to live, almost literally, across the street from some pretty great American history. 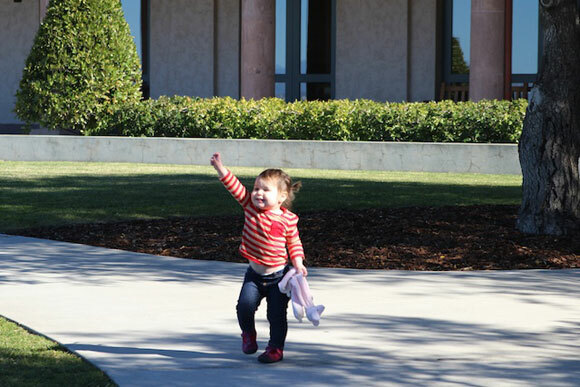 The Reagan Presidential Library is a stoplight away, and two weeks ago, we enjoyed a Saturday afternoon there when we were thinking of a unique family activity. 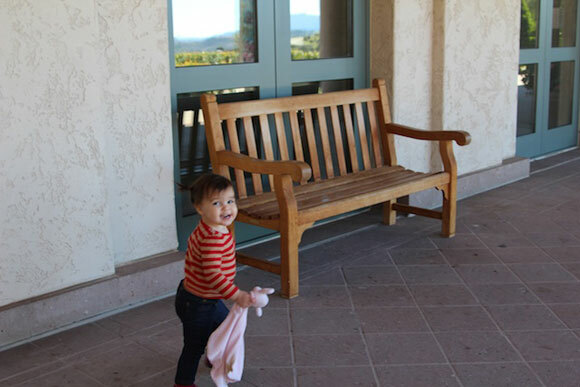 We had been talking about braving Disneyland for Madelyn’s first visit and since the Reagan Library is currently home to a Disney history exhibit, we thought we’d give our little princess some Disney background knowledge before our trip to the house of mouse. But first, we traipsed through the permanent Reagan history exhibit, which is a fabulously curated journey through my first president’s stint as POTUS. 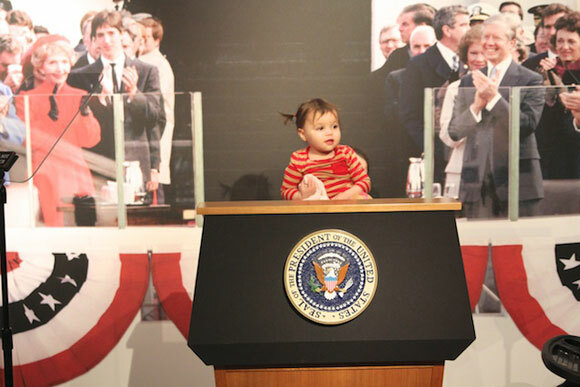 One of my favorite parts of the museum is the podium and teleprompter simulator. Madelyn gave a very moving speech. As her campaign manager, I suggest you cast your vote: Madelyn 4 Prez! My fellow Toddlers, read my lips: no new naps. It wasn’t our first visit there, though. We took Madelyn when she was four months old. Serving as President really ages a person. Typical politics. Not much has changed in a year. Even the people in the crowd haven’t moved! Psshhh. 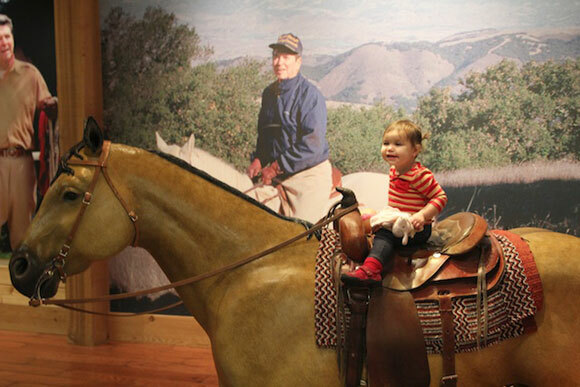 The end of the Reagan museum also showcases his later years and his love for horses and ranch life. Madelyn saddled up and rode next to Ronnie. 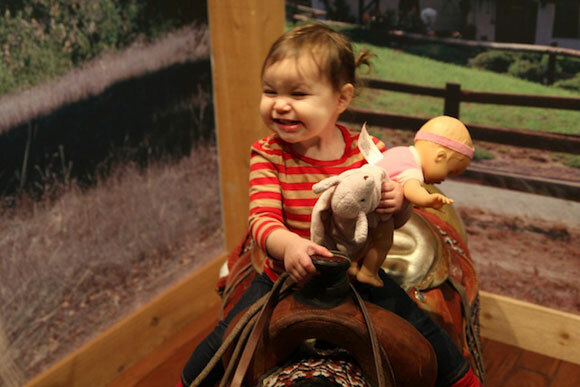 She seems to enjoy the horsey. OMG! Madelyn rides a horse WITH NO LEGS. Galloping on a plastic horse. Air conditioning blowing through her hair. Girlfriend is stoked. We finally made it to the Disney exhibit and viewed some of Walt’s early characters and a replica of his exact studio office, including a model of the piano that the Sherman brothers had played on several times on the lot. 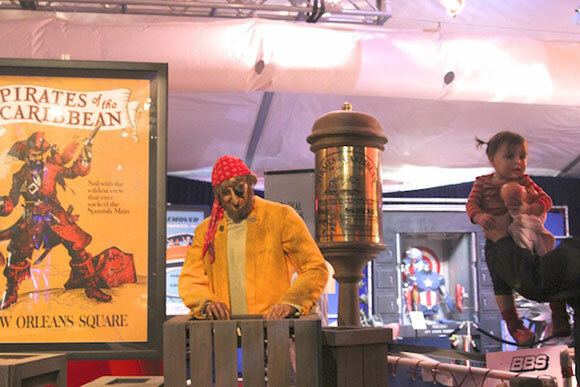 In a separate downstairs tented area was a display of costumes from Disney projects like “Enchanted” and Broadway shows. I was wishing right then that Madelyn was old enough to be into princesses. She would’ve flipped over seeing the gown that Giselle wears when she arrives in New York City. 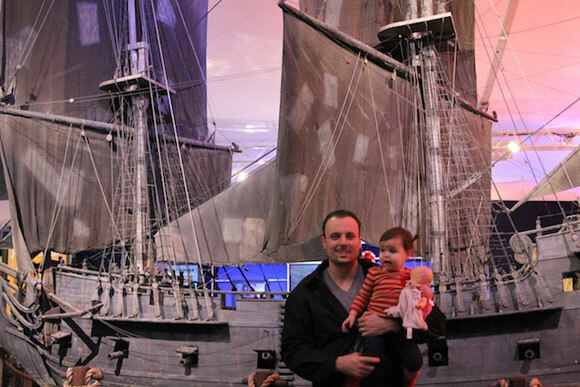 We also saw a lot of Pirates of the Caribbean movie paraphernalia, like costumes, model ships, and props. I never saw any of these movies so I wasn’t really wowed by any of it, and by then, Madelyn was kind of over the whole museum experience. But still, movie history is always interesting to see. 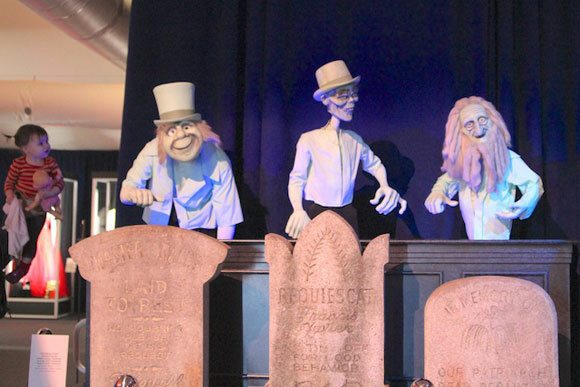 I loved seeing some of the ghoulish characters from The Haunted Mansion ride at Disneyland. Madelyn posed next to them without being too spooked. I think I am more impressed by artifacts from rides than from movies. Madelyn seemed to be impressed by neither. 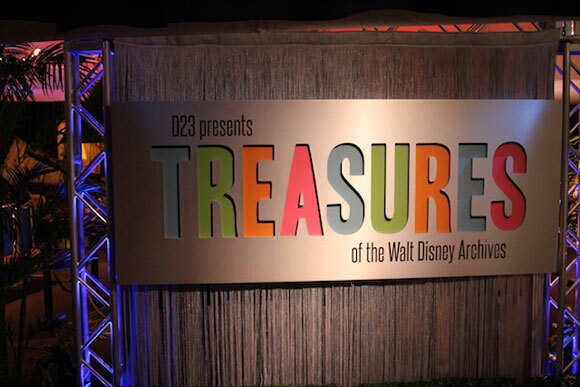 Overall, I’d say this exhibit was a little overhyped and I’m not sure it was worth the cost increase in admission to the Library, but I’m still glad we went because it pumped me up for our upcoming trip to Disneyland. 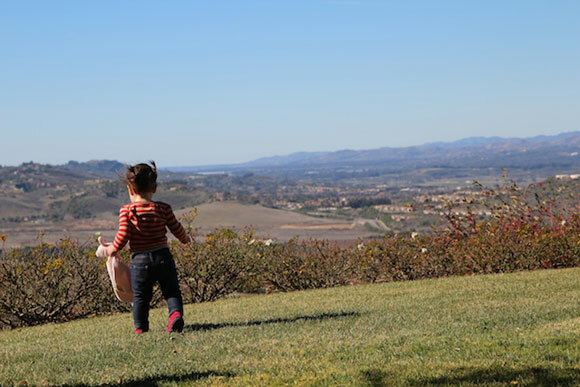 At the end of our time inside, Madelyn was pretty restless, so we let her run around the beautiful lawn with the stunning views. 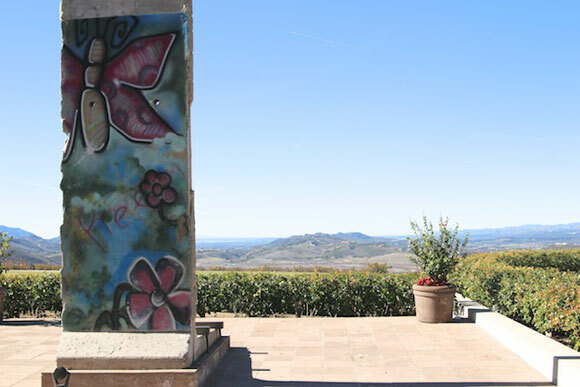 I always get chills when I see the portion of the Berlin wall displayed beween the Library outdoor corridor and the endless views of the mountains and sky. Though a little windy, it was a gorgeous day at the Reagan Library and I always feel a little extra American pride when I’m there. Bryan and I agreed that politics, shmolitics — it’s cool to have this landmark and cavern of our country’s history in our town. 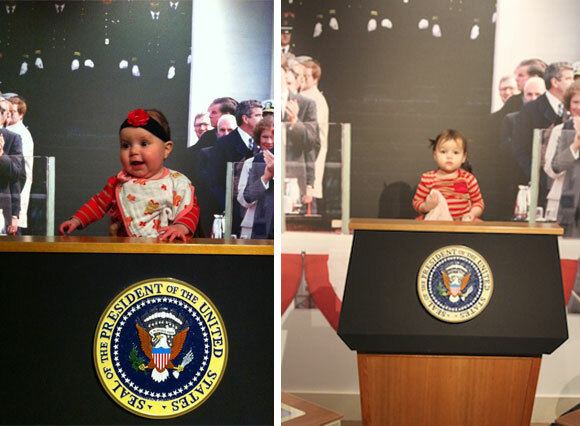 I love these pictures, especially the 2 pics of Madelyn behind the inaguaral podium. Did you notice that the shirts she’s wearing are very similar? Her slogan should be “A Lovey in every crib.”. 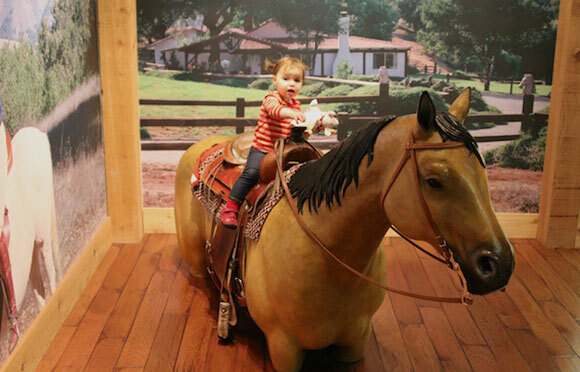 It looks like Madelyn mostly enjoyed running around outside, but she should take up horseback riding too. Love you Madelyn!